Smartphone-maker Xiaomi Corp.’s comeback in its home market came to an end in the third quarter, as the globally minded company posted its first sales decline in more than a year amid stiff competition. Apple Inc. and Oppo also posted sales declines during the quarter in China, which recorded an overall 10.2% drop in shipments for the three months through October, according to new data from IDC. 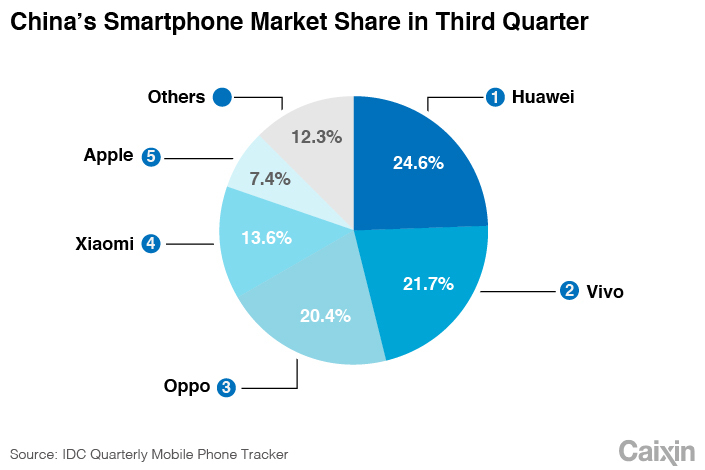 The only major players to post growth during that time were Huawei, which consolidated its spot as the nation’s biggest player, and Vivo, which overtook Oppo for the No. 2 spot. 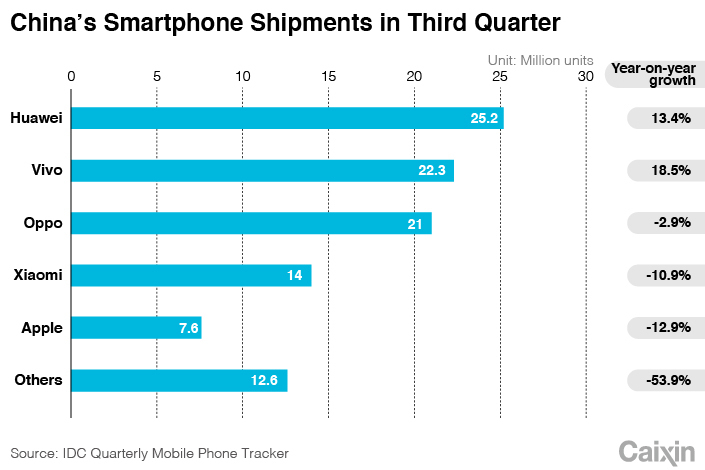 China is the world’s largest smartphone market, with 102.7 million units shipped in the third quarter. But it is also one of the most hotly contested, with more than a dozen major players and many smaller ones vying for share. Reflecting the pain being felt by many of those smaller players, shipments for brands outside the top five plummeted 53.9% during the quarter, giving that group less than a quarter of the overall market as the sector consolidates. Within the top five, Xiaomi’s 10.9% shipment decline for the quarter marked a major turning point for the company, ending five consecutive quarters of rapid growth as it rebounded from a difficult period back in 2016. “Since the beginning of this year, as Xiaomi continues to increase the proportion of mid- and high-end models in its product line, its shipment growth has slowed down and declined,” IDC said. It pointed out that Xiaomi’s average selling price rose 20% for the quarter from a year earlier, higher than any of the other top five players, as the company continued to try to move toward the higher end of the market where margins are higher and competition less stiff. As part of that campaign the company has pushed aggressively into Western Europe over the past year, and now sells its models in Spain, Italy, France and Greece, with plans to launch in Britain by the end of this week. But about 80% of its sales volume in those markets is still for its lower-end models, according to IDC.